Hello and happy fall! Nothing makes me happier than updating my fall bedroom. And today, I am joining some very talented ladies for our annual Welcoming Fall Home Tour. If you are coming from Edith & Evelyn, welcome! I am a huge fan of Cindy’s! 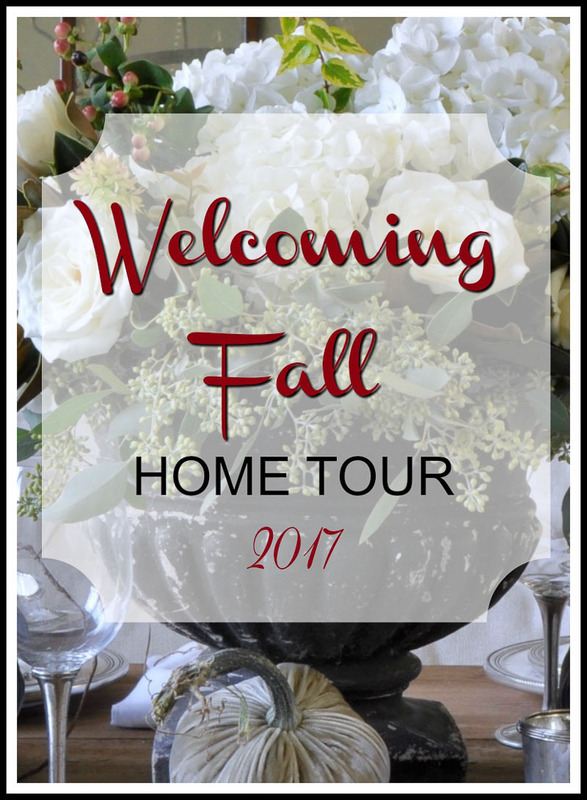 As this fabulous group invites you into their homes to see how they welcome fall, I will be welcoming you to tour all of the homes and find at least one new decorating idea to try this year. Push yourself to do a little more to celebrate this beautiful season! For some reason, each fall I am always eager to begin decorating my bedroom. Perhaps it’s because I’m always cold and the thought of getting out extra layers of bedding and throws makes me happy. 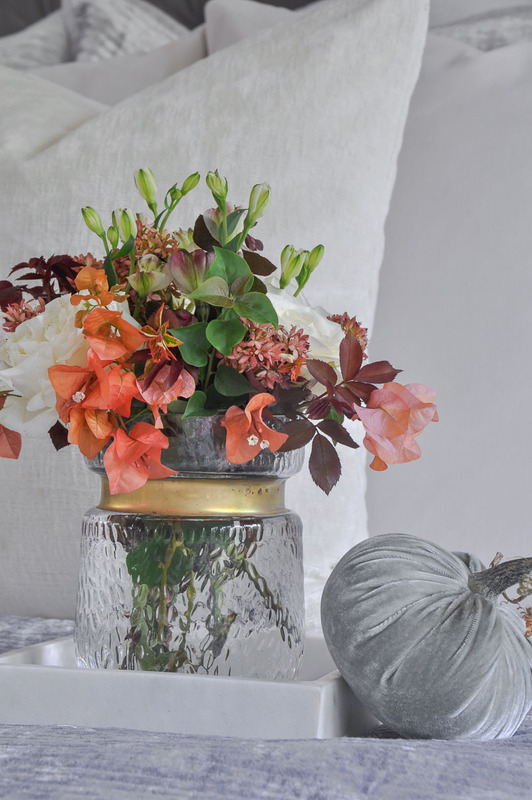 And, isn’t that the key to fall decorating? All of the extra layers? 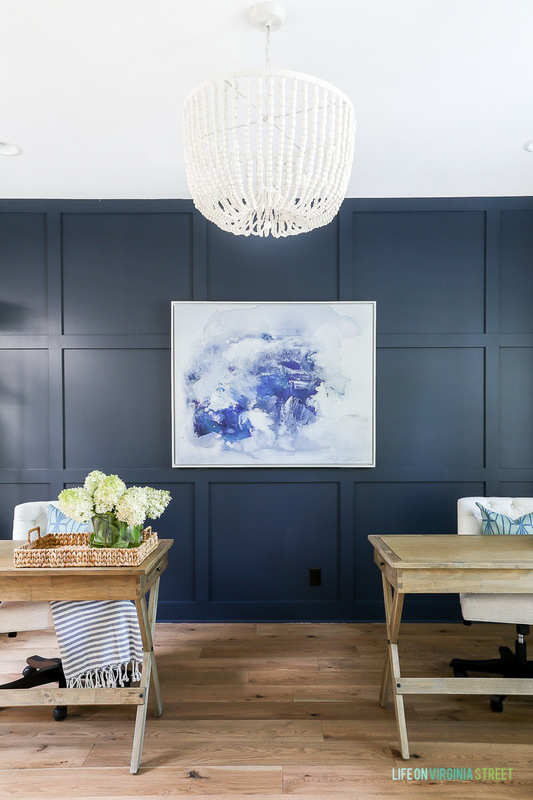 I’ve shared this tip before, but you can read all of my 2017 fall decorating tips HERE. 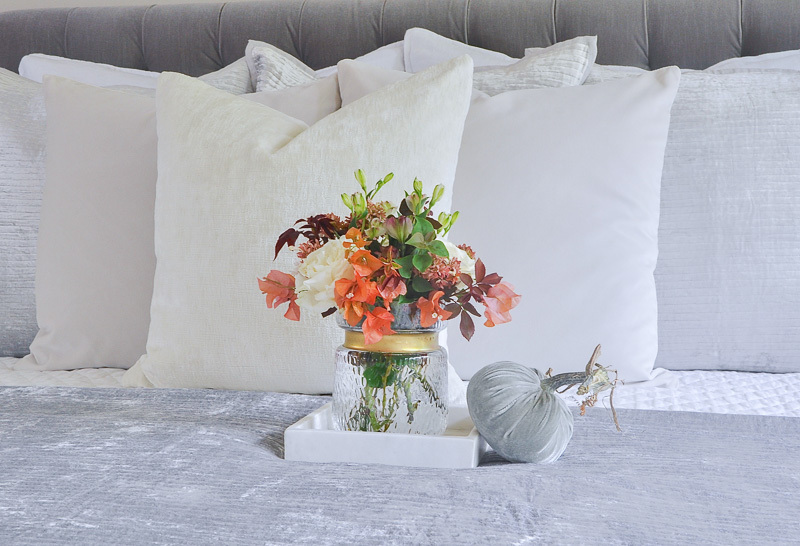 So, let’s begin in my fall bedroom with layering. 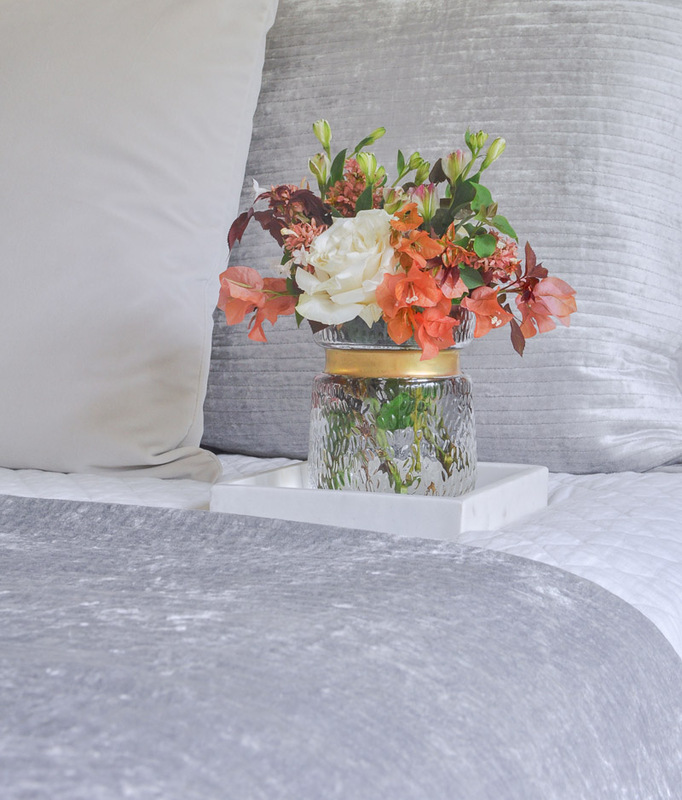 By adding extra blankets and bedding, I gave the room an elegant yet cozy, seasonal look. 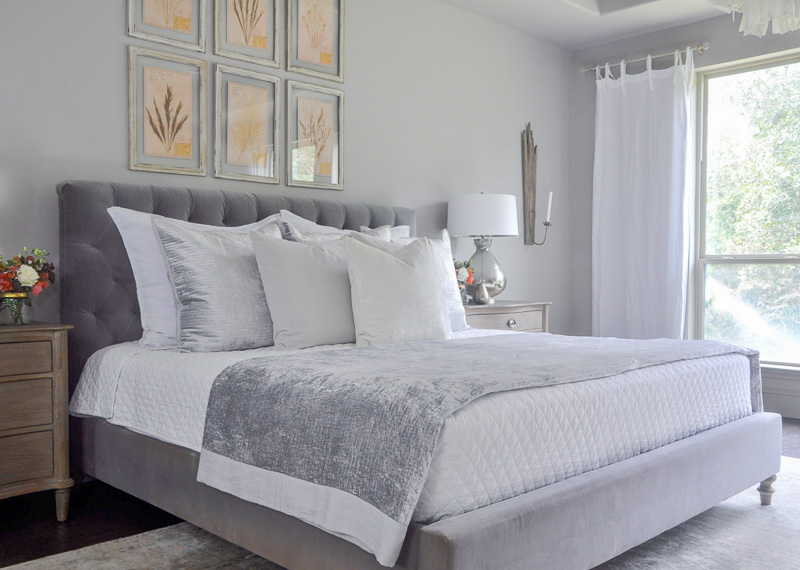 The gorgeous silver velvet bedding is new. It is from The White Company and I am thrilled with the quality. First, the velvet quilt with channel stitching and the most beautiful euro shams (or cushion covers as they call them) provide the perfect amount of contrast to the white pieces I already had. I wish you could see all of the bedding in person. It is truly my favorite combination to date. 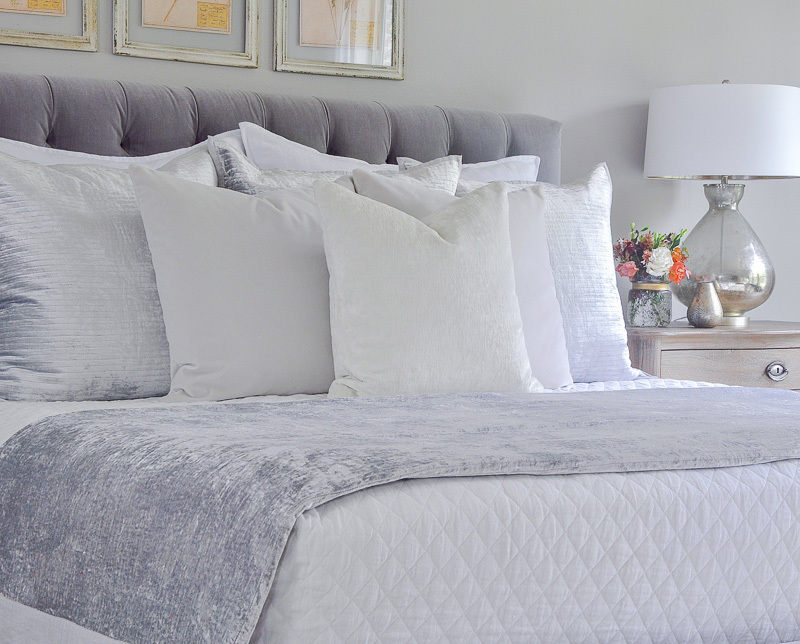 Secondly, to provide a very layered look with the pillows, I started with two big pillows, next added the three new shams, then two 22-inch dove gray velvet pillows, and lastly I added one cotton velvet pillow. The coverlet I frequently use has a quilted diamond pattern. Next, for this floral accent, I purchased a few roses and mixed them with clippings from my yard. 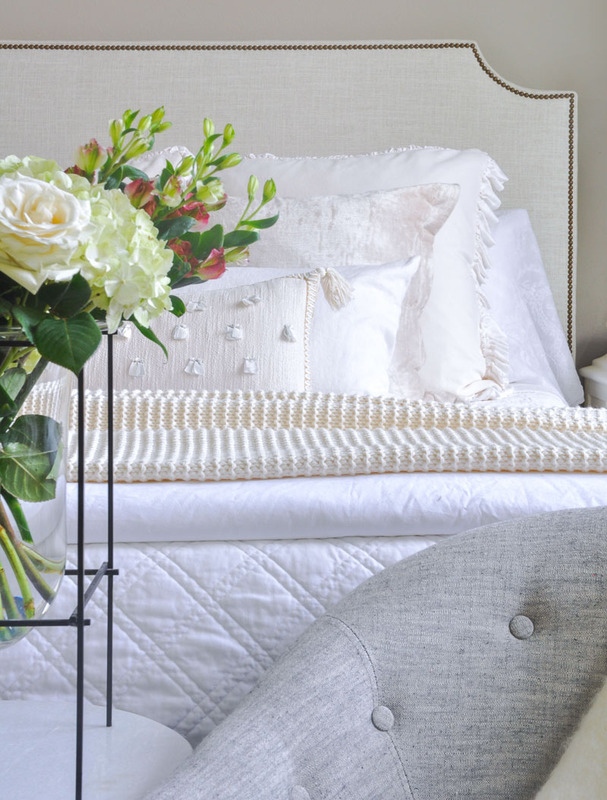 I love the symmetrical look of matching arrangements on both nightstands. 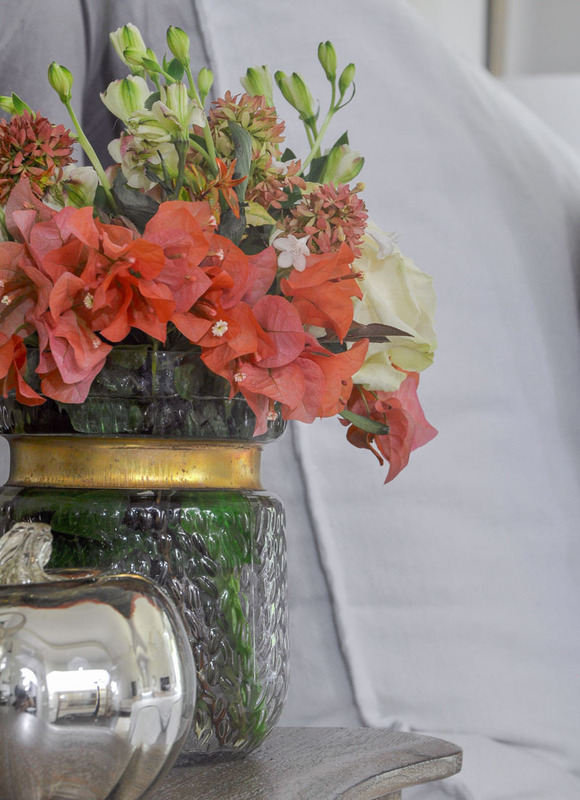 Additionally, using vases, each with a band of gold, next to the silver lamps and accessories was one of the ways I combined different metals. I still love this long term trend, especially in cooler months. 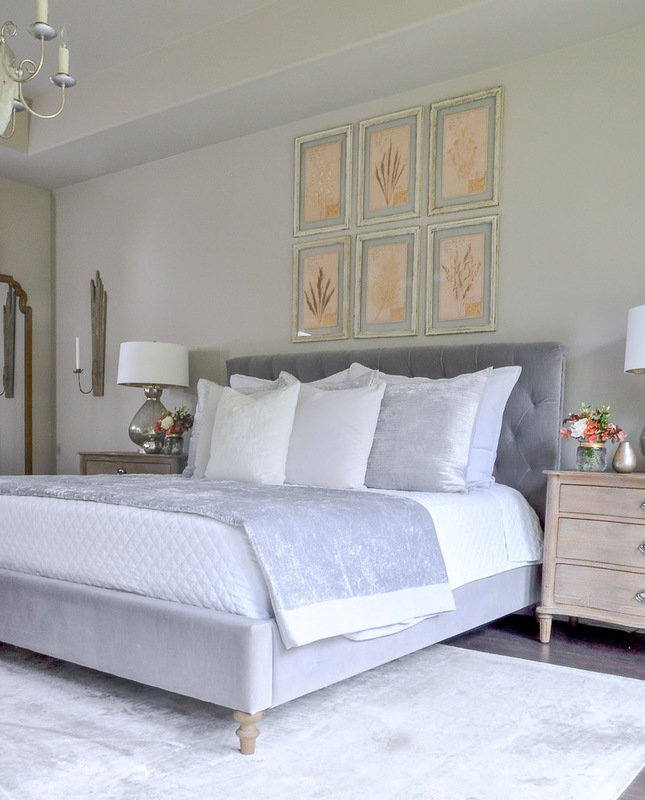 I’m still completely in love with my new chandelier from my recent master bedroom update. 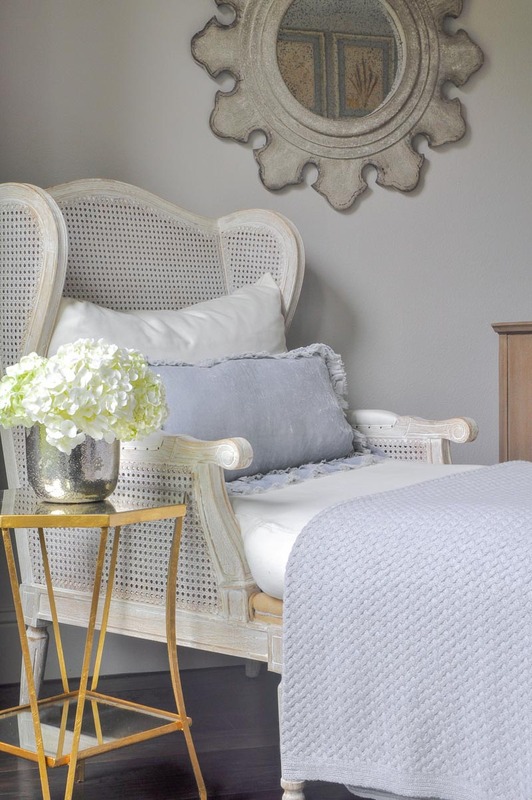 The cream and silver of the bedding and corner chaise are perfect compliments to the capiz shells and silver finish of the chandelier by Aidan Gray. Also, the White Company throw is new too. I adore the texture and at 79″ long, I am thrilled with the size! 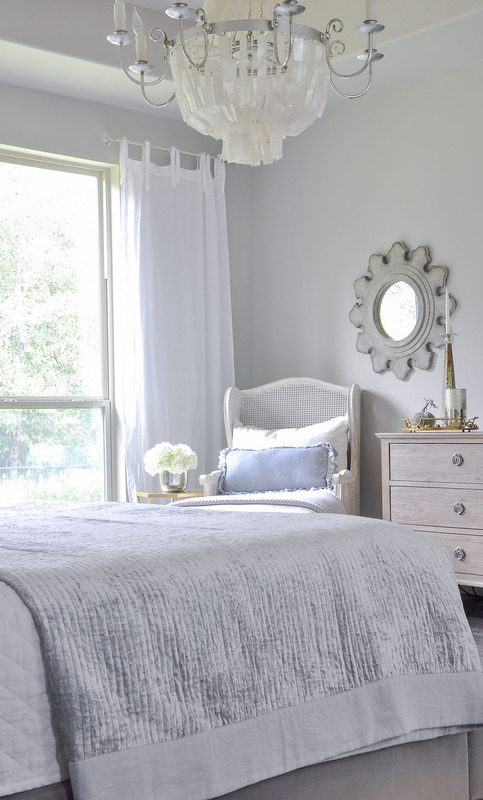 I’ll be spending lots of time in this sunny fall bedroom spot as the days get cooler. I hope this stop on the tour has been inspiring! If you’d like to stay in touch, I would love for you to SUBSCRIBE HERE. The darling velvet pumpkin was designed by my friend Daria from Hot Skwash. See how I styled it last year HERE and HERE and stay tuned for additional stylings very soon!!! Please continue by visiting my sweet friend Sarah from Life on Virginia Street next. She has the most beautiful design aesthetic and you will love what she has added for fall! Finally, here’s a sneak peek of my full home fall tour coming up soon! Be sure to subscribe to Decor Gold Designs for notification! While some items for this tour are provided at no cost to Decor Gold Designs, including items from The White Company and Aidan Gray, my comments about these items and all others are my honest opinions. Jen I love the silvery bedding in your beautiful room! What a beautiful way to welcome fall! I want to curl up and take a nap in there! It’s so luxurious! Happy Fall my friend! I bet you are disappointed when you have to stay in a hotel! I’d never want to leave that fantabulous bedroom! What a magical space! 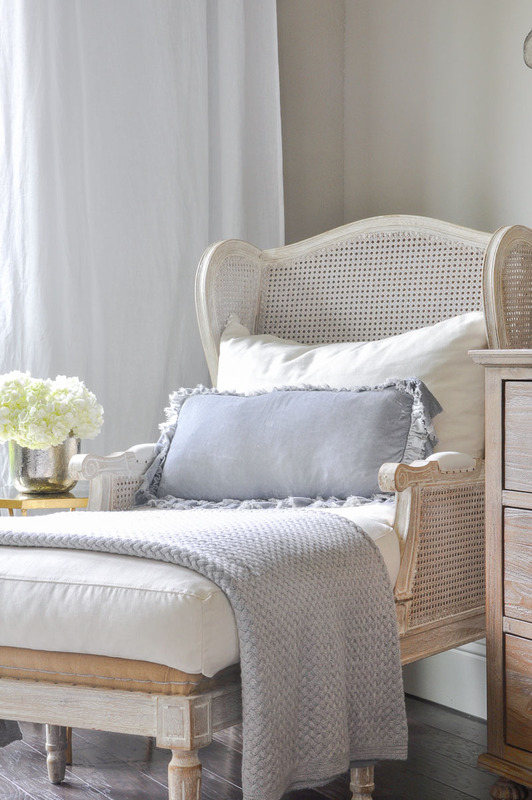 The bed is so inviting and the chaise is just stunning. 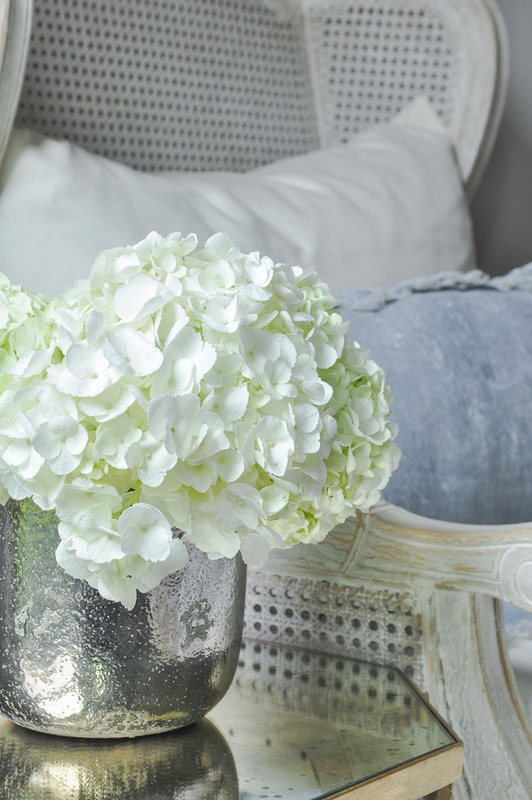 Can you share where you got the gray ruffled lumbar pillow from that’s on your lounge chair? Love it. Thank you! It’s from a local store in the Houston area and I have been unable to find it online. Sorry! This room is so sensual and luxurious! I love the contrast of velvet and metal, tufting and quilting against smooth, crisp linens, serene grey playing with touches of warm gold – a subtle yet complex design scheme. Pure gorgeousness! So gorgeous Jen! I don’t think your bed could be made anymore perfectly! !